Built on the shores of a sheltered bay in downtown Cabo San Lucas, Marina Cabo San Lucas has all of the modern amenities of a world-class marina resort. This unparalleled facility presents superior services for luxury yacht captains, their passengers, crew, and vessels. Yachtsmen from all over the world will be satisfied with the extraordinary quality of amenities and services at the Cabo San Lucas Marina. Cabo San Lucas Marina has docking facilities for almost four hundred vessels including concrete slips spacious enough to berth vessels with a twelve-foot draft and a two-hundred-foot length. The compound not only presents standard maritime services, but also a score of other conveniences. The design of this high-tech facility took every potential need of boaters into consideration. A principal anxiety for any captain is security; Cabo Marina was planned with this worry in mind. Cabo Marina operates with twenty-four--hour closed-circuit surveillance observed by a qualified security workforce. Magnetic card-keys prevent illegitimate entry into the marina facility. Docked vessels have complete access to 110-30-amp connections as well as 220-50-amp outlets. The marina also houses a forty-thousand-gallon-per-day desalinization processor, supplying plenty of potable water. A cable television feed and wi-fi signal gives boat owners on-board entertainment. 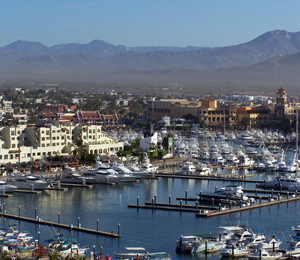 Cabo Marina houses a state-of-the-art fueling dock, offering both centrifuged diesel and gasoline. If your craft needs service or repair, the highly-trained staff of the marina’s boat-yard will provide optimal service. The marina has a twin-lane ramp in addition to a seventy-five-ton boat lift which can handle vessels with lengths of up to eighty feet. If you need licensing or paperwork, a government office is within walking distance from the marina. Boaters will be pleased with all of the on-site amenities including showers, bathrooms, laundry rooms, lockers, a chandlery, and a spacious parking lot. The outdoor recreation area has both a sand volleyball court and swimming pool. You can stroll from the marina to the local shops and charming eateries downtown. The best aspect of this marvelous facility is its location; Cabo San Lucas Marina is located just minutes away from some of the finest scuba diving sites and game-fishing waters in the world.